What better way to mark fifty years of studying religion at the University of Alabama than to institute our first graduate degree — something that’s been in planning for several years now? So it’s official. Visit the new web page. The degree has two major (and related) areas of focus: (1) social theory in the study of religion and (2) the public humanities. Or, to put it another way, the degree capitalizes on two specialties of the Department that have put it on the national stage: using the study of religion as a way into studying how identities are created and negotiated, while taking seriously the need to communicate our findings to wide audiences (sure, publishing in scholarly journals but also blogging and video production). Our assumption is that, just like many past REL undergraduate majors, those who pursue an M.A. with us may wish to go on to further studies (eventually applying to other schools for a Ph.D.) but they may also wish to put their degree to use in any number of other ways. So this degree, like our B.A., emphasizes skills — in particular, using social theory in the analysis of a specific set of cultural claims, practices, and institutions, as well as learning how to communicate your work (and thus the relevance of that work) to audiences far wider than just the academy. 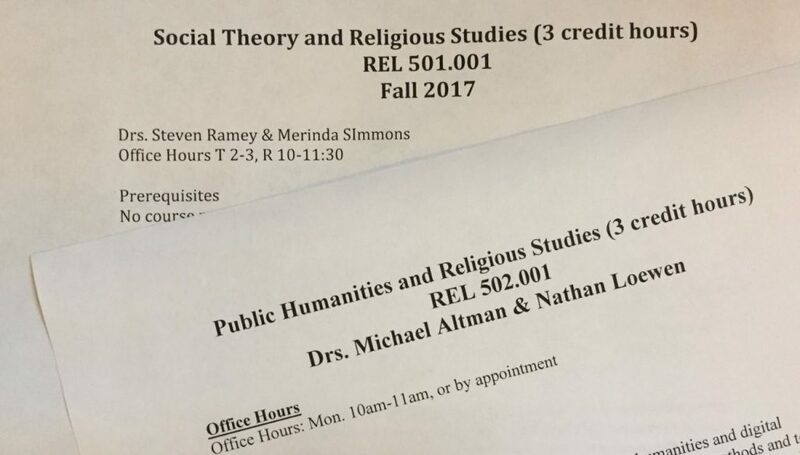 Each incoming class will therefore start their first Fall semester with two required Foundations courses plus an elective (the topic of which is determined in conversations with your supervisor); whereas one of those two required classes is devoted to social theory (the syllabus was developed by Profs. Ramey and Simmons) the other focuses on familiarity with the digital tools that students will use throughout their degree (developed by Profs. Altman and Loewen). While the former will introduce students to both classic and contemporary social theorists whose work on such topics as identity, gender, power, experience, race, class, the past, etc., sheds new light on how we study religion (and on what gets to count as something a scholar of religion can study), the latter equips students to find innovative and engaging ways to present their research. Working with the Alabama Digital Humanities Center and the Sanford Media Center (both located on campus in Gorgas Library), students in our Public Humanities Foundations course will learn everything from working with “big data” to producing a podcast from scratch. The aim is to integrate both toolboxes — social theory and digital skills — across the two year degree. While some courses may emphasize one over the other, all classes are an opportunity to integrate both. And both, we believe, are relevant for success beyond the M.A., whether in or outside of academia. This degree is 36 credit hours and culminates in a Capstone Graduate Seminar (in which students present and provide feedback to each other as their final projects develop) and up to 6 hours of thesis (consisting of either an original scholarly article, suitable for submission to a peer review journal, or an original digital project); a monthly required (but non-credit) graduate colloquium also runs each semester (aimed to prepare students for a variety of futures after their degree, therefore covering key professional topics). 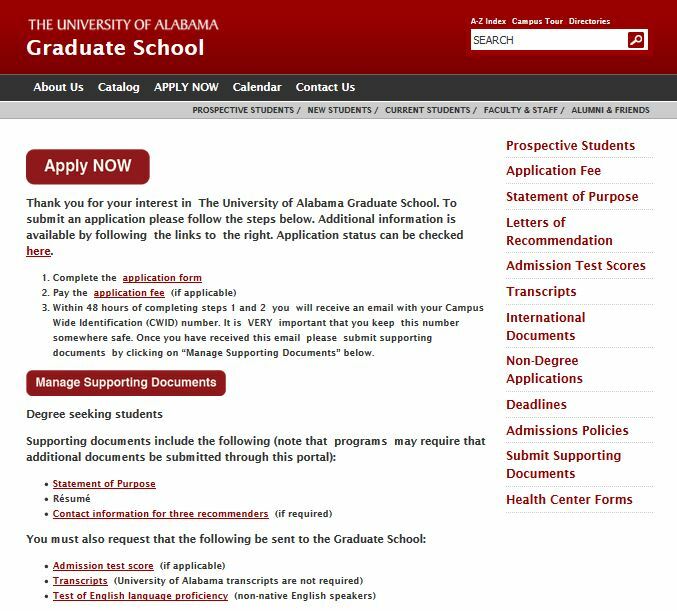 All grad students will also work closely with a faculty mentor to gain experience in undergraduate classes (both lecture and online formats) and, ideally, doing so co-writing with their supervisor. Students will be assigned a supervisor upon being accepted into the degree and the particular shape of each student’s program — for example, are languages required? might a course in another Department help their work? — will be determined by supervisors in conversation with their advisees and the Graduate Director. So applicants should be aware of what our faculty members work on before applying, to make sure that we’re the right place for you. Applications will soon be live online (we’ll make public when they are); to be considered, applicants will need to submit a program of study in their cover letter, current CV, undergraduate transcripts, and scores from either the Graduate Records Exam or the Miller Analogy Test. Three letters of reference are also required. A limited number of either half or full Graduate Teaching Assistantships (including tuition waiver and stipend) are available. If you’re interested in more information, please contact our Graduate Director, Prof. Merinda Simmons. 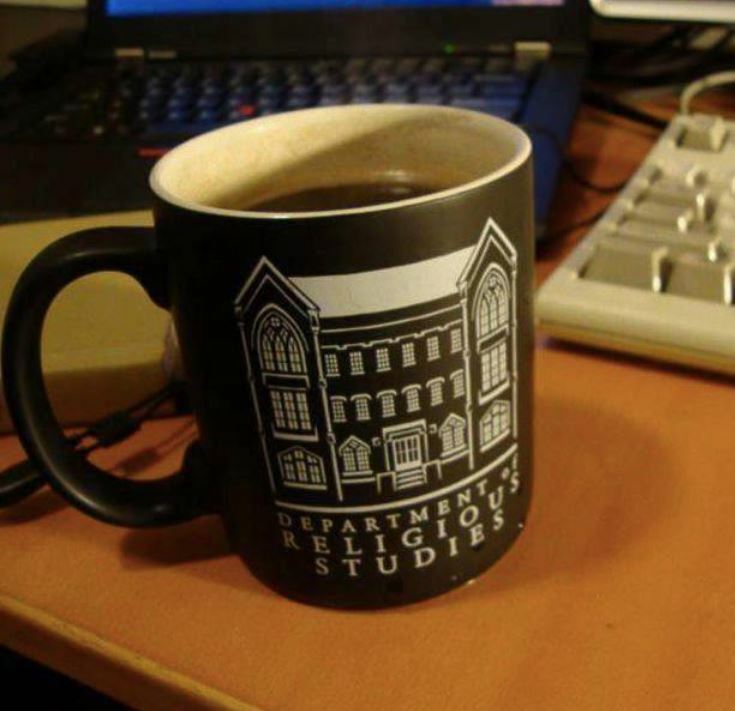 This entry was posted in Faculty Blog, Relevance of Humanities, Religion in Culture and tagged Anniversary, MA, New Degree Master, Religion in Culture by Russell McCutcheon. Bookmark the permalink.